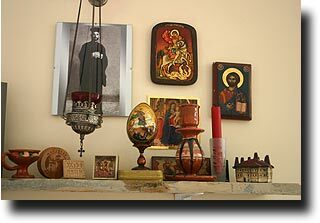 Every Serbian household has a patron saint and usually has an icon of him or her on the wall. We adopted St. George and enshrined him in our living room. We chose him for several reasons: my grandfather, a Greek Orthodox priest, was named George. He is also a popular saint, and easy to find representations of in many places. Plus, that picture of him fighting the dragon is sooo cool! Indeed, no one can be turned away from a slava, as opening one's home to others is tradition. We were invited to several slavas during our time in Belgrade, and the symbolism and joy that accompanies them was a wonder to behold. 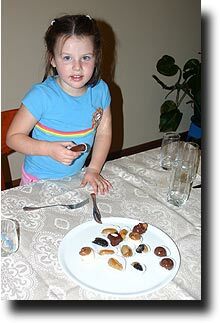 A tradition unique to the Serbs is the Slava, the celebration of the family's saint. Passed down through the son, each family has a particular Orthodox saint that they hold a festive celebration and feast to each year. Lasting up to three days, this is a time when friends and family are invited to celebrate together. Nearly every aspect of the meal is wrapped up in traditions whose origin lie shrouded in history, but here is an overview of some of the ones we learned about. At the start of the slava, a priest comes to bless the house and the inhabitants, often showering the place with incense, and a slava candle is lit - symbolizing God's light of life - to burn throughout the meal. 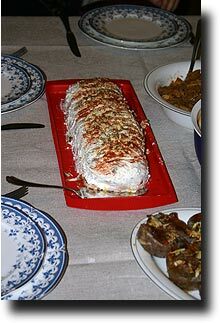 A special slava bread (slavsky kolac) is prepared with a cross cut into its top to remind visitors of Christ's promise that "I am the living bread which came down from heaven" (John 6:51). 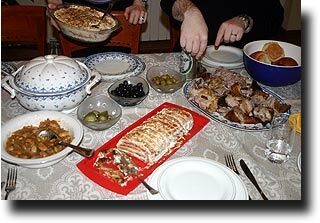 Next to it is placed a bowl of boiled wheat mixed with honey and spices (kolyivo or slavsko zhito). The wheat symbolizes several different things: it is in honor of the patron saint, it is in memory of deceased relatives, it represents the death and resurection of Christ, and it acts a reminder of the unity of Orthodox Christians everywhere - set apart from the rest of the world. 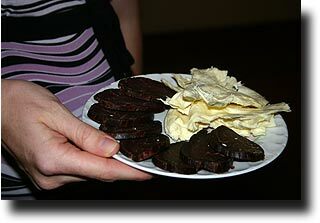 The traditional drink is red wine, to represent Christ's blood. It is also used to extinguish the candle at the end of the celebration. Other symbols are more particular to the family. 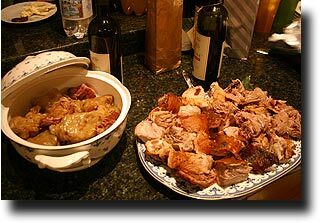 They might be traditional foods from their family's village, dishes that remind them of other special days, or meals that have significance for the particular family. 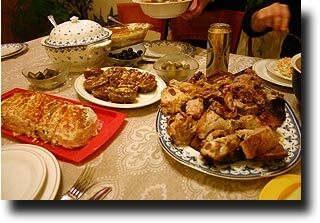 The pictures on this page are from friends of ours whose traditions come from Montenegro, and the meal relfected that heritage.